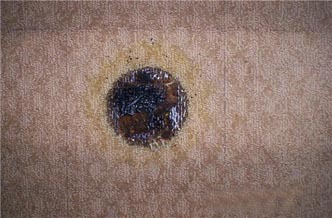 How to fix hookah burned carpet! Have you ever dropped a coal on your carpet, only to have a nasty burn? I think it’s happened to every serious hookah smoker at least once. But don’t worry – your security deposit isn’t gone yet! It’s pretty easy to fix your mildly burned carpets. After the burn has set, and the spot has cooled, take the rough edge of your tongs and ruff up the carpet a little. This will break up some of that burnt carpet. Don’t do this too hard or you will ruin the carpet! Apply some carpet cleaner to the burned area, and scrub it around. We want to get the burned area clean so our repairs stick! Take a clean towel and blot the area until its dry. Try to find a concealed piece of spare carpet. In the corner of a closet works. The idea is to get a small square of carpet from somewhere it won’t be missed from. Cut out as much of the burned area as you can. This should leave a bald spot on the carpet. Cut a small piece of your spare carpet to match the size of your hole. Pull all the lose pieces off. Put a little bit of super glue on the bottom of your cut-to-size spare piece, and press it into place. Use your carpet scrubbing brush and gently rub over the area to smooth it over.